Cattle markets continued to rise this week as tight supply and improving demand continued. 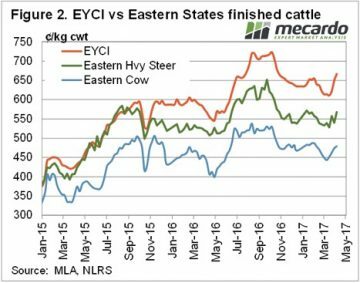 The Eastern Young Cattle Indicator (EYCI) has streaked to a new 2017 high, and sits 100¢ higher than last year. Finished cattle prices have participated in the rise, but have been left in the wake of young cattle. 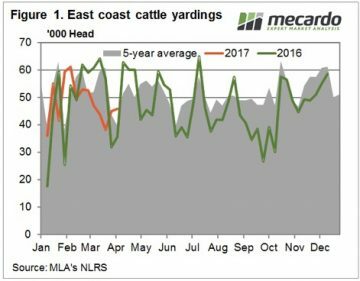 Figure 1 shows that the strong prices failed to draw out more cattle this week, with East Coast cattle yardings increasing just 1,300 head. Cattle yardings were down 28% on the same week last year. In fact almost every week of autumn (except for Easter) 2016 saw yardings above 60,000 head. Over the last 8 weeks cattle yardings haven’t managed to crack 52,000 head. Most of the action was again in young cattle markets this week. The EYCI gained 27¢ this week to hit a six month high of 666¢/kg cwt, almost exactly 100¢ higher than last year. 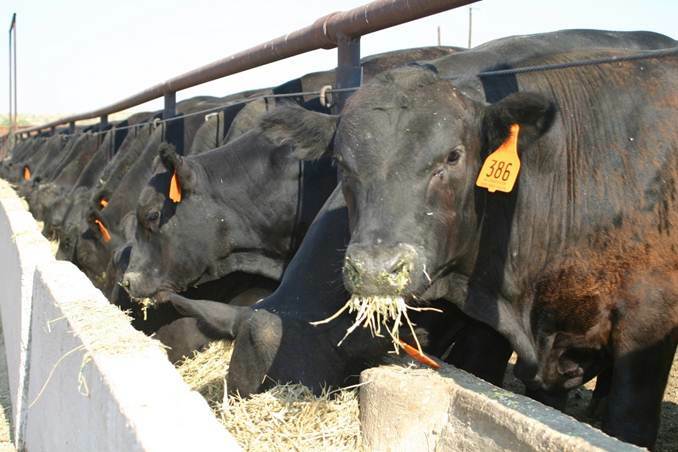 The increase in young cattle prices was largely driven by feeders and restockers. Queensland feeders gained 15¢/kg lwt, while in NSW they were 9¢ higher, to hit 344¢ and 357¢/kg lwt respectively. Slaughter cattle prices haven’t managed to hit new 2017 highs yet. Heavy steers bounced back this week, gaining 27¢ on the east coast to sit just below the opening price of 2017, at 568¢/kg cwt. It’s s similar story for Cows, with prices sitting a few cents below the February high. Export prices eased marginally this week, with the 90CL indicator coming off highs, down 4¢ to 614¢/kg swt. While export prices have improved from the start of the year, if supply picks up here we can expect cattle prices to head back towards export levels. It will be interesting to see if the rise in the EYCI stops, or at least starts to slow. It’s hard to see any increases in supply, as it seems the cattle either aren’t there, or are unable to make it to market. The concern for buyers is if supplies are tight now, it’s a long time until September when the spring supply hits the market. There might be a flush when the floods recede, but it’s likely to be short-lived.